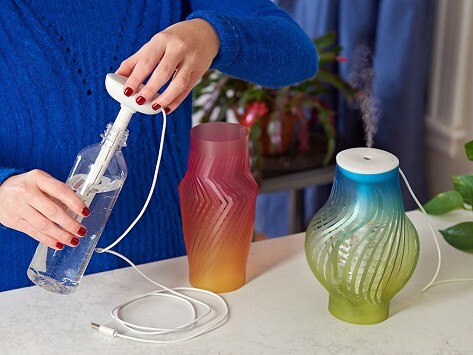 A water bottle humidifier makes it easy to add moisture to the air in your space, wherever that space might be. The compact, USB-powered design fits onto most standard water bottles and is suited to work in small areas (think desk or bedside table) or while you’re traveling. Features like light modes, adjustable spray, and a timer help set the just-right scene. You can even add essential oils to the water. Text for directions very tiny and light. Unreadable. Called to complain. Was directed to directions on web that can be enlarged, but still very light. This water bottle humidifier is one of those so-smart ideas that had us wondering, why didn’t we think of that? For Sookyoung Kim and the team at SPEXTRUM, it’s the kind of solution they are always thinking about. SPEXTRUM is all about elevating the everyday essentials to function well and look good. Their compact humidifier is a perfect example of their approach. It’s USB-powered to go just about anywhere with you and works in smaller spaces, like on a desk or bedside. A removable shade can disguise it—and it looks nice lit up, because of course this humidifier lights up. There are many other features built in, too, like adjustable mist, light modes, and a timer. All that packed into a bottle-top humidifier? Why didn’t we think of that?